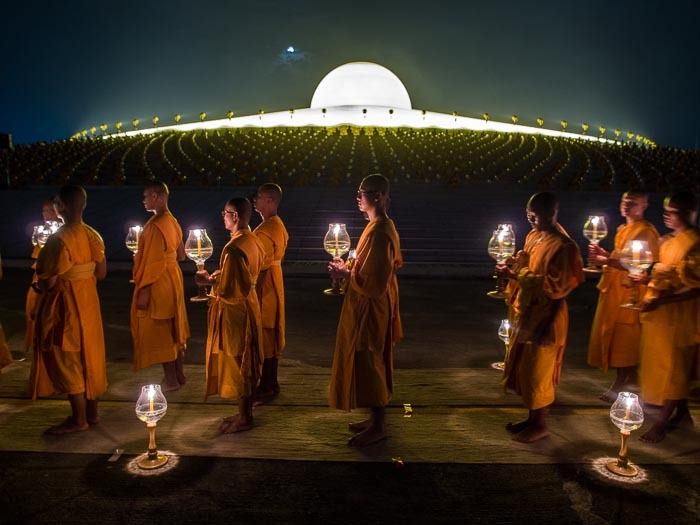 Buddhist monks line up for the candlelight procession at Wat Phra Dhammakaya in Pathum Thani. Friday was Makha Bucha Day one of the most important religious holidays in Thailand (and other Theravada Buddhist countries like Myanmar, Cambodia and Laos). It marks the day in Buddhist history when more than 1,200 Arhantas (enlightened ones) spontaneously came to hear the Buddha preach more than 2,500 years ago. People come to their temples in the morning to pray and make merit by presenting monks with food, flowers and money. They come back in the evening to meditate. The observances culminate with a candlelight procession around the temple. Monks file into Wat Phra Dhammakaya for Makha Bucha Day. 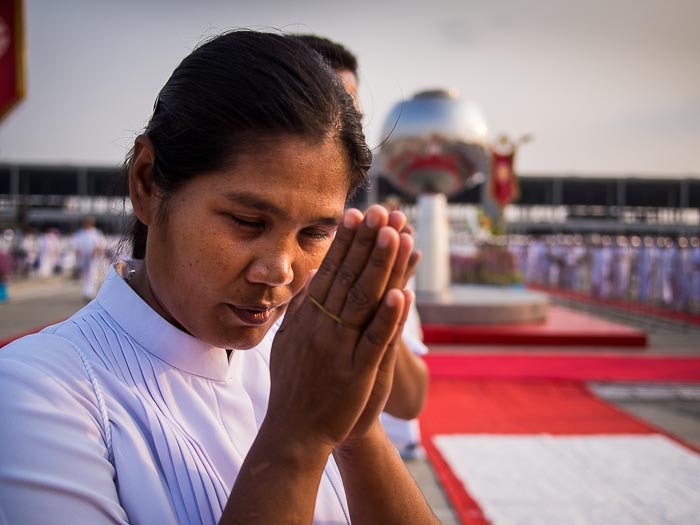 Wat Phra Dhammakaya is the most unique Buddhist temple in Thailand. It's in Pathum Thani province, about an hour from my apartment in Bangkok. The temple looks nothing like traditional Thai temples - more than anything it looks like a giant UFO in a rice paddy waiting to lift off for the heavens. 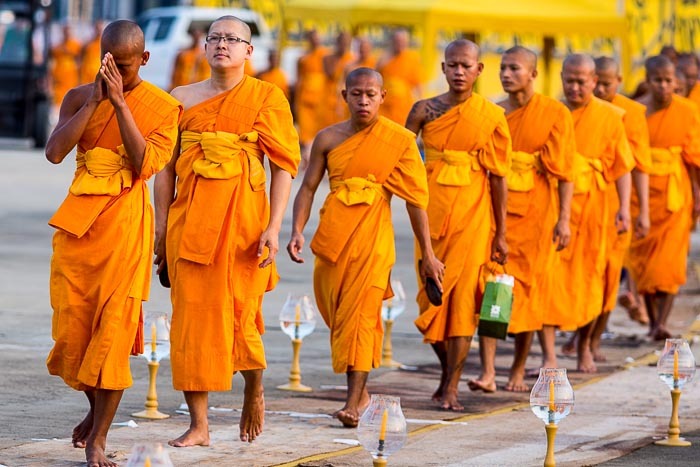 It's the home of the Dhammakaya sect of Theravada Buddhists and not without controversy but it hosts one of the most spectacular Makha Bucha observances in the Bangkok area. 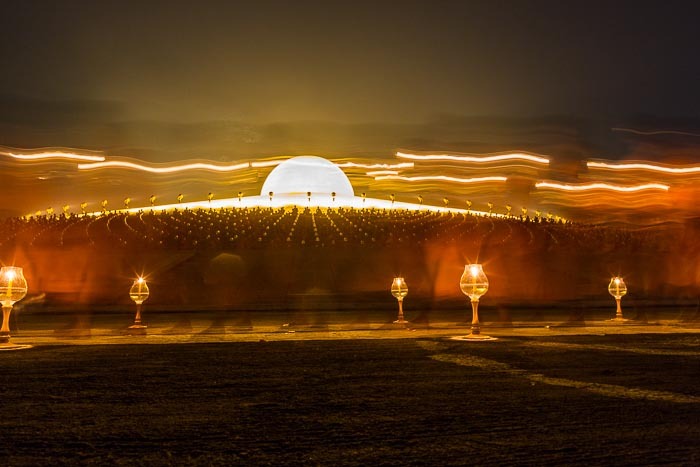 A time exposure of monks walking around the main Cetiya (dome shaped stupa) at Wat Phra Dhammakaya. Back in the long gone days of film, photographing something like this meant using ISO400 transparency film and "pushing" it one stop to ISO800. Pushing film meant deliberately underexposing it and then extending the development time to make up for the underexposure, it almost always was a Faustian bargain. ISO400 film was not that good to begin with (low contrast, lots of grain) and the process of pushing it aggravated its already poor qualities. Digital handles high ISO much, much better than film ever did. We have access to really clean ISOs in the 1600 - 3200 range, something we could only dream of back in the day. But there are times when even ISO3200 is not enough. The candlelight processions at Makha Bucha Day is one of those times. It's dark, really dark, around the Cetiya and we were kept a good distance away from it so it meant using long lenses. When the candlelight processions started I pulled out a small table top tripod I have, put it on the ground and very quickly made a series of time exposures of the monks. After I photographed the monks, I turned around and photographed the lay people, who had their own candlelight procession on the walkway on the perimeter of the Cetiya. A woman prays at the beginning of the evening meditation service.